Hopefully I can get some feedback with the colour scheme before I paint the rest, of which there are many. 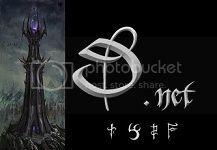 Last edited by With hatred ... on Fri Sep 26, 2014 11:50 pm, edited 1 time in total. Nice change of pace, looks great. 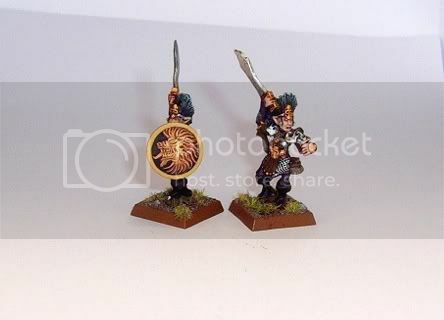 sorry man, but thise miniatures look like… ugly miniatures i dont care how classic they are, they are ugly. I knew they wouldn't be to everyone's taste, I appreciate your honesty. As long as the colours are ok. The colours are ok. But...really? Those are elves?? Nicely painted but fugly in the extreme. 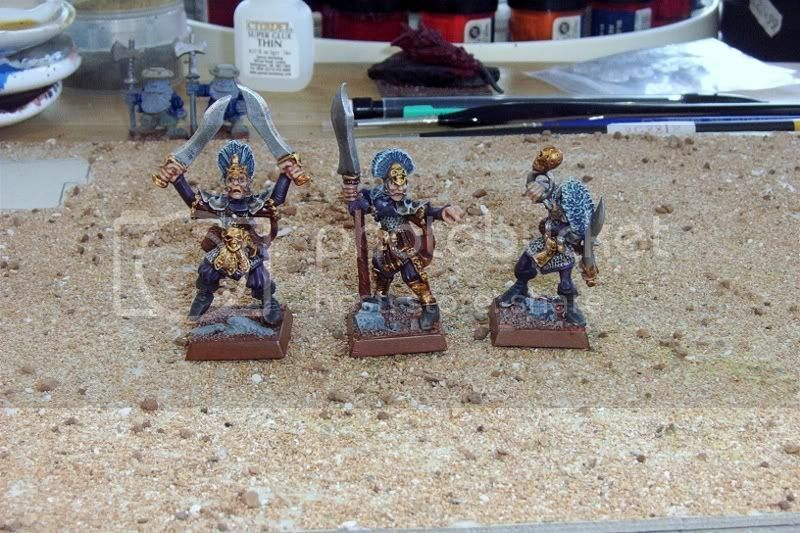 Model wise I think they look more like dark gnomes than dark elves but they are well painted. I can see that one. Now I'm thinking of the D&D Deep Gnomes, what with their fancy for crossbows and summoning massive earth elementals. 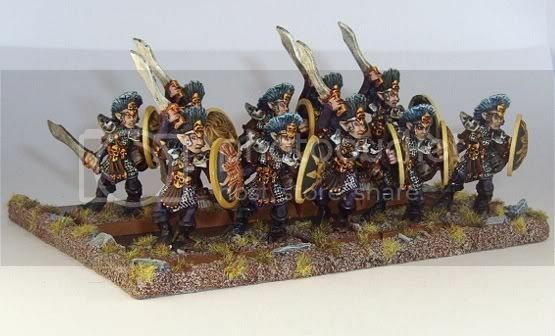 Yup definitely dark elves, that's what we had back in the late 80's early 90's. The design development has come a long way since then. It's just a bit of nostalgia on my part. I think they're great. The subdued colour scheme is fine. love them!! 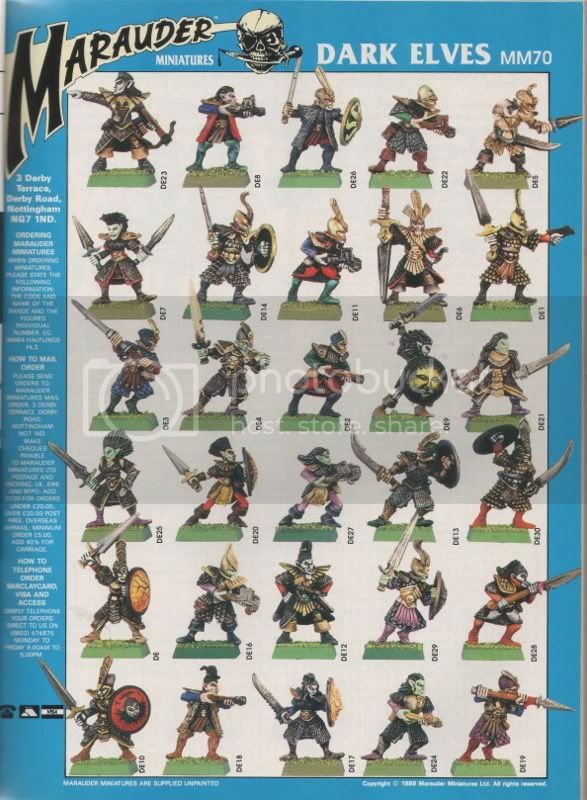 really love this old school range of minis! 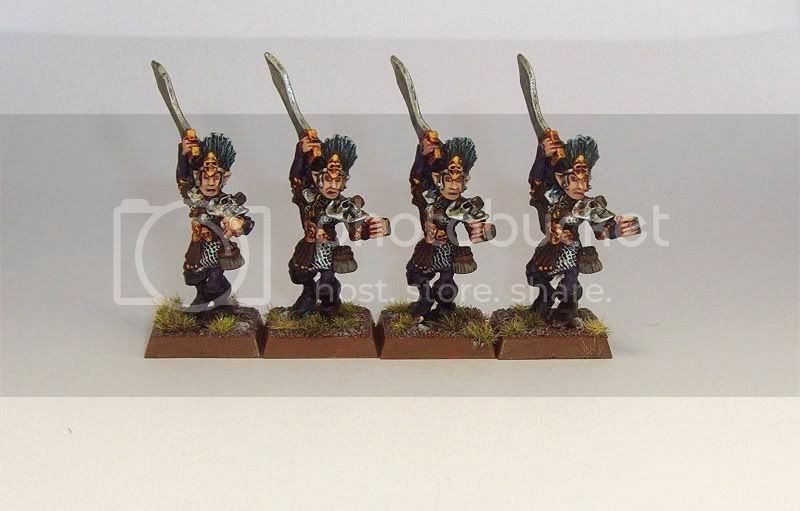 I have a whole bunch of these models too, but I painted them as male witch elves (the hair is very witch elf ish). I love the models, keep going! Cheers Red, do you have any pictures of yours, I'd love to see them? Next up will be the male counterparts, hopefully soon. Then I'll have a go at the command figures. OMG These look awesome!!!! Vintage always rocks! 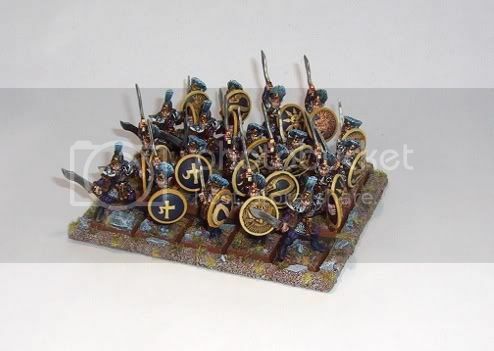 Loving those shields!! So that's 20 done now. On the table ready to go are another 10, once they are done I can start the command group, really looking forward to getting them done. Very very nice indeed. 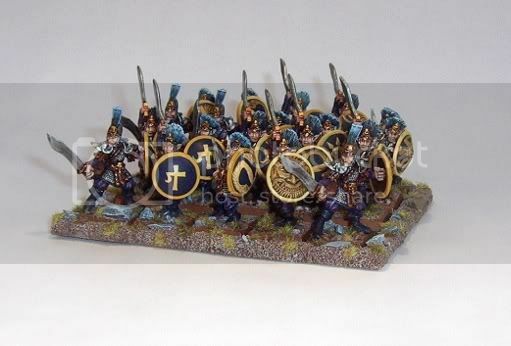 Lets hope swordsmen make a reappearance in the next army book. I´d love to play with such a unit. I borrowed your idea of mixing yellow and gold btw. Thanks a lot! You have reached the Department of Circular Reasoning. Only a quick update with little progress but at least it's progress. 3 of the comand figures are almost done, just need to do a few touch-ups here and there and some black lining. Then I need to think about what to do with the standard. I remember some of these old models. 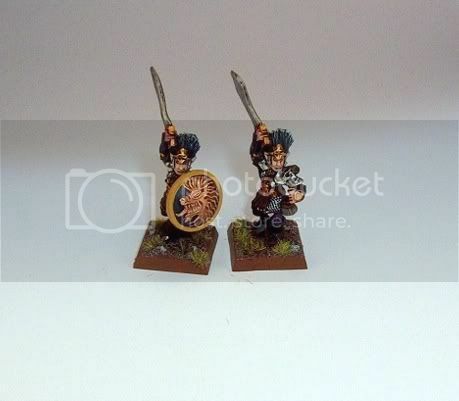 They date from before I was into Dark Elves -- I was a Skaven player way back in 3rd Ed. Really cool to see these painted up. "All who surrender will be enslaved; whoever does not surrender but opposes with struggle and dissension, shall be annihilated." 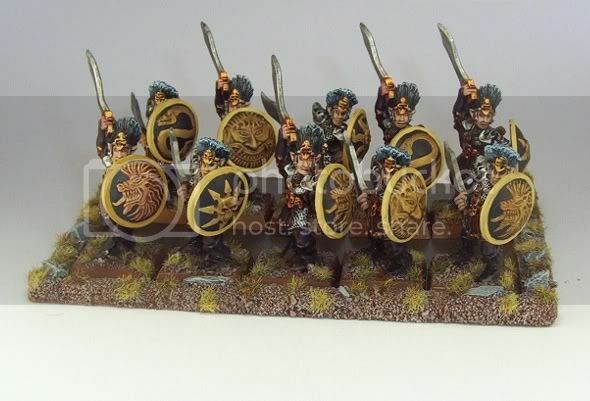 These are great, love the old style mini's. Your colour scheme has been well executed, good attention to details - what's next? All I need is the time. Thanks guys, no progress on the banner I'm afraid. Must try harder.